Marketing & Public Relations, Inc.
FOR IMMEDIATE RELEASE . . Rancho Mirage, California – March 2, 2015 . . Jewish Federation of the Desert, headquartered in Rancho Mirage, California, hosted their donors from this community at a first-time collaboration with New York-based America-Israel Cultural Foundation. Over 60 guests attended this elegant reception held at Tamarisk Country Club. For 75 years, the America-Israel Cultural Foundation has played a leading role in the development of Israel’s arts and culture. From early support of nearly all of Israel’s largest institutions, to nourishing its finest artists, the name AICF has become synonymous with culture in Israel. The America-Israel Cultural Foundation has been cultivating Israel’s future artistic leaders by identifying and nurturing Israel’s top emerging artists and furthering their education and careers through scholarships and grants. By encouraging Israeli artists and supporting institutions and programs, AICF makes a vital contribution to the cultural foundation of Israel and strengthens her relationship with the United States. The organization’s success is evidenced by the increasing talent and depth of Israel culture, and the fact that Israeli culture is growing and thriving even in a difficult economy. 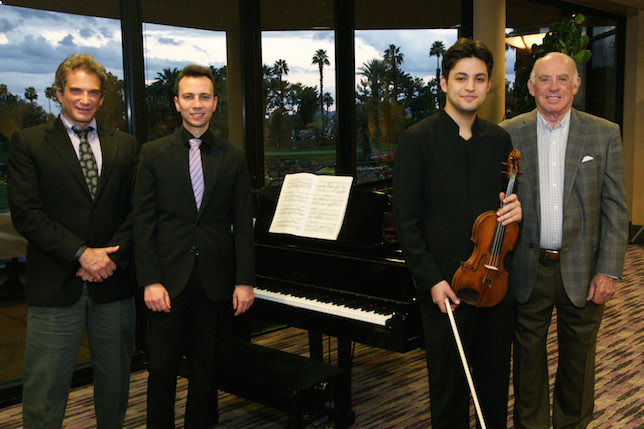 “We are delighted to be hosting this special evening exclusively for our donors who make an annual commitment of $ 5,000.00 per household, and to be presenting the amazing talents of these two young and acclaimed Israeli musicians, Asi Matathias on violin and Victor Stanislavsky on piano,” stated CEO of Jewish Federation of the Desert, Bruce Landgarten. “We decided to host this smaller venue for these donors in order to judge the level of interest in this inaugural event. Judging from the terrific response received, Jewish Federation of the Desert is considering hosting a larger venue next season, so that all our donors will be able to experience the top-level talent of these performers. We wish to thank our three event Co-sponsors, Bernard Reiter, Howard Levy, and Jack Cohen, who helped support Jewish Federation’s efforts in bringing the fine work of the America-Israel Cultural Foundation’s top talent to our community,” Landgarten continued. Following the sumptuous hors d’oeuvres and wine reception, guests enjoyed the music performed by these two Israeli musicians from works by Brahms, Beethoven, Strauss, Toru Takemitsu, Saint Saens, and Sarasate. Guests in attendance included Bernard & Janet Reiter, Jack Cohen, Pat & Howard Levy, Sondi & Bruce Green, Helen Varon, Josh & Alona Salama, Patty & Bob Mack, Margie Kulp, Annette & Larry Novack, Elliott & Judith Cohen, Henry & Joyce Freund, Paul & Stephanie Ross, Bobbie Stern, and Larry & Eileen Zoll. Jewish Federation of Palm Springs and Desert Area is the largest Jewish fundraising organization in the desert community, helping people in the Coachella Valley, in Israel and around the world. The Jewish Federation of Palm Springs and Desert Area, as the central communal organization for the Jewish population for the Coachella Valley, is dedicated to promoting the values and quality of Jewish life for future generations. The Federation is further committed to the unity of the Jewish people worldwide, the strengthening of the state of Israel, and to helping Jews in need wherever they reside. The Jewish community in the Greater Palm Springs area has exploded in growth during the past decade. As the demand for services continues to increase, the needs of a growing population must be one of Jewish Federation of the Desert’s top priorities. Their Federation-supported programs and agencies restore hope and mend the lives of our most vulnerable – the elderly, the homeless, the under-educated, victims of abuse and violence, and others in need. Through strategic endeavors, they support a spectrum of crucial social services including counseling, group therapy, special needs programs, emergency food assistance, mentoring/literacy programs and risk intervention. Madeline Zuckerman Marketing & Public Relations, Inc.